You can fly to Tioman. Berjaya Air flies once or twice daily (depending on the season) to Tioman from both Kuala Lumpur's Subang Airport and Singapore's Changi. Flights arrive at Tioman Airport in Tekek. 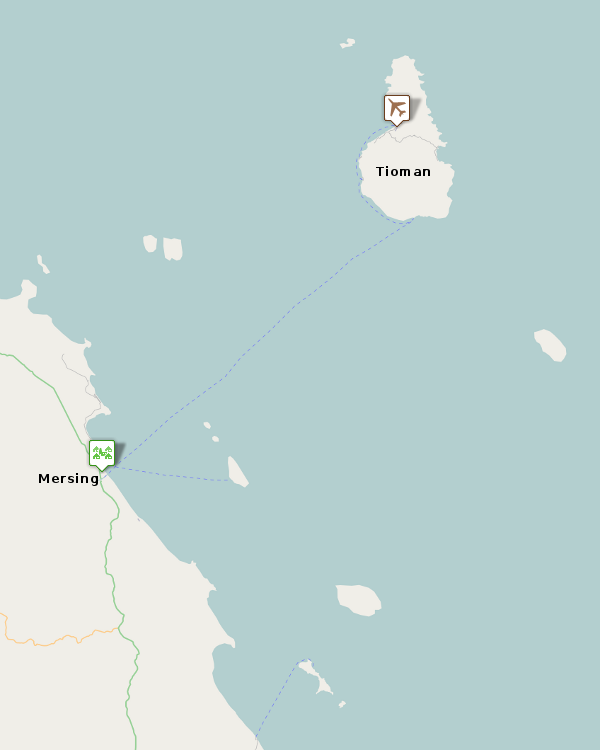 The alternative to flying is to travel overland from elsewhere in peninsular Malaysia or Singapore to Mersing on the coast, and from there take a ferry to Tioman. The ferry takes about one hour and 30 minutes. Fares run from 35 to 45 Ringgit (7.12 USD - 9.16 USD), with the higher rate applying around holidays. Depending on the season there are several departures each day, with the exact times dependent on the tides as well as whether or not there are enough passengers. You can book tickets in advance from Tioman Ferry.